An Australian archaeologist working from his armchair in Perth has unearthed almost two thousand potential archaeological sites in Saudi Arabia. Far and away from the Indiana Jones-style imagery archaeologists inspire, high resolution photography is allowing researchers to unearth world-changing discoveries using little more than Google Maps. Professor David Kennedy, from the University of Western Australia, has never visited Saudi Arabia but scanned 1240 square kilometres of the country using Google Earth and found 1977 potential archaeological sites. This included 1082 ancient tombs shaped like tear drops. 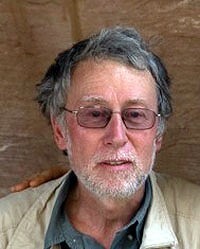 Professor David Kennedy, who made the discovery. Kennedy was able to confirm the legitimacy of two of the finds by asking a friend in Saudi Arabia to drive out to the sites and photograph them. He believes they may be up to 9000 years old. In a similar instance in 2008, a PhD student at La Trobe University in Melbourne uncovered hundreds of previously unknown sites in Afghanistan using Google Earth. Like Saudi Arabia, Afghanistan can present hostile challenges to researchers and the online mapping service provides a safe way to explore the country. "Saudi Arabia has a rich archaeological heritage but it is relatively poorly recorded and understood," said Kennedy in an email interview. "The extensive remains of great prehistoric cemeteries in such places as Yabrin in the interior have been known for many years but little-explored. More widely, extensive and numerous ruins are known in many areas but seldom recorded even superficially." Kennedy told New Scientist that Saudi Arabia was "not the easiest country to break into" and it was difficult to even fly over the nation - but he said Google Earth "can outflank them". In his paper on the find, published in the Journal of Archaeological Science, Kennedy writes: "It is readily apparent that the use of GE [Google Earth] for the prospection and identification of sites has great potential when dealing with a huge area that is otherwise largely inaccessible on the ground." However, further ground verification is needed to confirm the significance of the sites. "Just from Google Earth it's impossible to know whether we have found a Bedouin structure that was made 150 years ago, or 10,000 years ago," Kennedy told New Scientist. In the journal paper Kennedy said initial investigations revealed most of the discoveries were "pre-Islamic". It is thought that the Islamic regime in Saudi Arabia is hostile to archaeology because it may focus attention on pre-Islamic civilisations there. Kennedy did not express a view on this but said Saudi Arabia was one of the least explored countries archaeologically. "Saudi Arabia covers 2.15 million sq km - twice the size of the UK, France and Germany together," Kennedy writes in the paper. "On the other hand, it is one of the least explored countries archaeologically." Britain's Daily Telegraph newspaper reported that 90 per cent of the archaeological treasures in the holy cities of Mecca and Medina had been destroyed to make way for hotels, apartment blocks and parking facilities. Last year, Saudi clerics reportedly renewed long-standing calls for the demolition of several historic Islamic sites. In 2008 and 2009 other Google Maps researchers discovered rare meteorite impact craters in Western Australia and the Northern Territory. In 2008, a Western Australia man said he felt like Charles Darwin after discovering - via Google Earth - an extensive formation of fringing coral reefs just west of the Kimberley. In 2007 Google Maps revealed an aerial image of a US nuclear-powered submarine and, separately, evidence of China's nuclear submarine capability. In 2006 an Australian granny living in a small Canadian prairie town discovered an intriguing rock formation that looks like an iPod-wearing native American. But while Google Maps has been a boon for academics, it's also caused international conflicts with Nicaraguan troops blaming a Google Maps error for them invading Costa Rica in November last year. Other errors have created tensions between Morocco and Spain. In December last year the Iranian government was reportedly furious after Google Maps satellite images revealed a Star of David painted on he roof of the Iran Air headquarters.